This vehicle crashed after the driver led police on a 100 mph chase. A suspect who led police on a chase at speeds up to 100 mph early Friday morning remains on the loose. 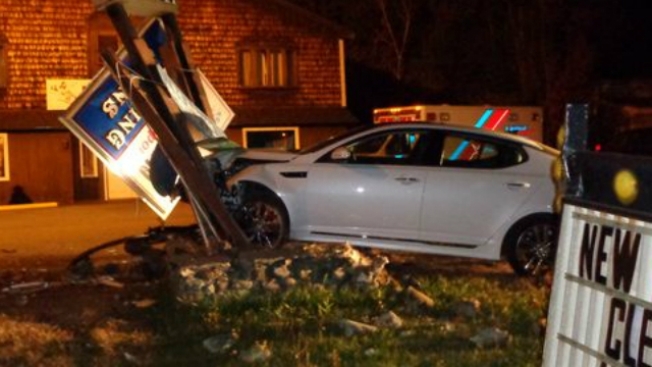 According to WCSH-TV, the Cumberland County Sheriff's Department is searching for the driver of a stolen car that crashed into a sign in Bridgton around 2 a.m. The chase began when the car passed a sheriff's deputy on Route 302 in Naples going 100 mph while driving in the middle of the road. The deputy gave chase and saw the car almost hit a tractor trailer before losing sight of it as it headed toward Bridgton. Another deputy set up spike mats, which slowed the vehicle. The vehicle eventually smashed into a sign at R.G. Johnson Sporting Goods in Bridgton. The driver fled the scene and remains at large. Anyone with information is asked to call the Cumberland County Sheriff at 207-893-2810.